A while back I met up with Kyle to take a look at his stroke. You can see right away that he has a good rhythm and is comfortable in the water. He’s an Ironman finisher, so this isn’t exactly his first lap in the pool. There are a couple of things that jump out at me right way though. And that, if you read this site much, is the fun part, as I get to pick it apart. Let’s get started. Looking at the above video it’s pretty clear that that Kyle is dropping his elbow. This is extremely common, and often hard to fix for alot of people. Watch as his right arm pulls through the water. About a third the way through the pull you can see a definitive “<” form with his arm (Let pretend that this symbol < represents his arm). 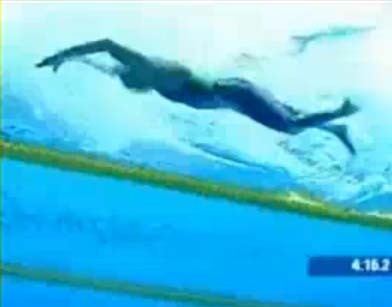 It becomes pretty clear to see that his elbow is leading that vertical plane of his pull through the water. Want you want to see is is more of an upside-down, backwards “L”. pulling through the water. In other words, his forearm needs to be vertical. Need a better visual than “<“? Fair enough. Lets do a side by side with Olympian Grant Hackett. Notice how different Hackett’s pull looks. He gets his elbow so high that he is hyper-extending his lats. It almost looks a little freaky in that last pic. This is extremely effective as you might guess. He’s got some serious Olympic hardware afterall. Now look at Kyle’s. It is almost the exact opposite. For the many of you out there who have asked me and are still confused on exactly what a high elbow is, these pics couldn’t be a better visual. This tends to be a tough habit to break. Drills like the fist drill, exaggerating a really deep pool, and various dryland/weight exercises can help break this. 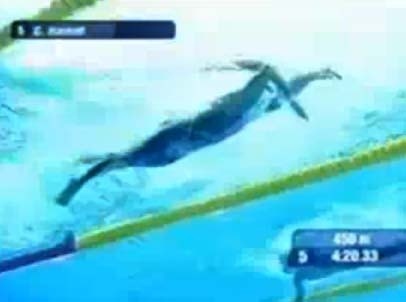 The next thing that I notice is the lopsided pull and recovery that you can see from the above water shot. As you can see, Kyle likes to breathe to the left. While there’s no problem with doing this on race day, to do it all the time during training creates an imbalance. In other words, you create a weak arm and a strong arm by favoring one side to the other. Take another look at the above water shot. 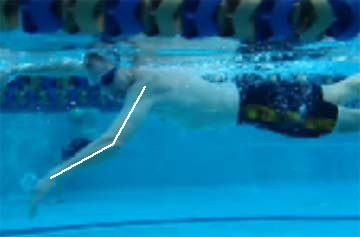 Notice where his left hand enters the water and extends versus the right hand. The left enters and extends pretty much straight forward. The right, on the other hand, enters the water and extends in a much wider position. There are other differences if you look underwater, but the bottom line is that having an unbalanced stroke can cause problems in your race. You will consistently swim off course, and the weak arm will tire and the form will begin to fail sooner. This all adds up to more work for you. The fix? Pretty easy actually. Learn to bilaterally breathe, or learn to breathe on both sides like a basketball player dribbles on both sides. Once you learn it, then you need to train using that style for at least 90% of your workout. Once you become proficient at it, you won’t even notice you are doing it. Then on raceday, just breathe as you need knowing that your form is balanced. Here’s another shot of the unbalance. As you can see in the above clip, Kyle’s right arm pulls much deeper than the left. A big part of this is because his body rotation is more pronounced when he breathes. Nonetheless, if one arm is pulling deeper/better than the other, you are going to end up with problems. The fix is the same as before. Learn to breathe from both sides equally as comfortable. Otherwise, you are going to be frustrated come race day. Lastly, I wanted to touch on Kyle’s kick briefly. In this clip you can get a pretty good look at his kick and his mechanics are really good. He kicks like one kicks a ball and not like he is running or cycling. The problem I see is the lack of flexibility in his ankles. The key to a good kick is that whipping motion you get from from a flexible ankle. Not unlike the motion of a fin. While it seems minor, an improved kick can make your life so much easier in the swim. The best part for kyle is that the fix is an easy one. STRETCH. Regularly do some kick sets with fins, and go home at night and sit on your ankles. Good luck and see you before the cannon fires.